The board starts off with one open question (the lead question) and the first team to answer it gets to open another question (which then becomes the lead question), but all open questions are still eligible to be answered by any of the teams at all times. Only team members can participate in the competition. You cannot get help from anyone but your teammates. The first team to answer a question gets 100% of the points for that question, the second team gets 95% and the remaining teams get 90% of the points. If two teams answer the same question at the exact same time, both of them get the same amount of points (they both deserve it). Teams will not be penalized for submitting an incorrect answer so, basically, every team has an unlimited number of tries for every question. But, attempting to brute force an answer is not allowed and will result in disqualification. Also, the game board throttles requests and you will get blocked before that happens. You are not allowed to perform any type of brute force on the servers or run any sort of scanners against them. We will let you know if brute forcing is allowed on any specific challenge. Abuse will be announced on the game board, so other teams will know you're trying to cheat. When a team answers a lead question correctly, it has 2 minutes to open the next lead question. 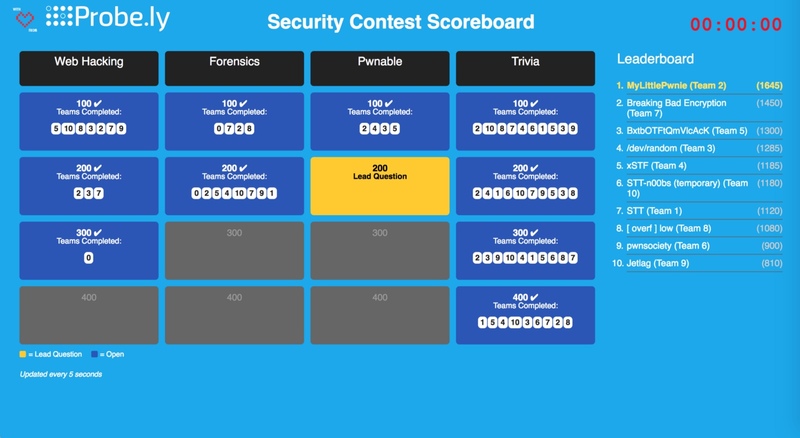 If the team fails to open another question within this time period, a random question will be opened from the set of questions that have the lowest score. If no progress happens over a 20-minute interval, a new random question will be opened. The competition staff may also open a new random question if the game looks stalled. The timer on the game board runs in your browser (client-side). The official game time is the server time. Answers that exceed 3:00:00 are rejected. Even though the timer on the game board is sync'ed with the server every 10 seconds, if the load on your computer is high, then the timer may lag by a few seconds.